This book contains numerous charts, tables, and maps, many in color -- plus 15 full-page black-and-white aerial photographs of as many assembly centers (including Manzanar Assembly [Reception] Center, later a War Relocation Center), and 149 (5 full-page, 144 half-page) photographs of life on the way to and in the assembly and relocation centers -- plus a glossary, appendices of memoranda and other administrative documents, and an index. DeWitt submitted the report -- under the subject heading "Final Report on Evacuation of Japanese from Certain Military Areas in Western Defense Command" -- to the Chief of Staff, United States Army, War Department, Washington, D. C. with a nine-paragraph letter of transmittal dated 5 June 1943 (pages vii-x). On 19 July, the Chief of Staff, George C. Marshall, forwarded DeWitt's report, with a simple transmittal note, to the Secretary of War, Henry L. Stimpson. This report is especially important as a mirror of how race and gender figured in the calculation of legal status in the United States at the time of the Pacific War. It underscores, more than any other publication, the banality of evil that Drinnon speaks of in Keeper of Concentration Camps: Dillon S. Myer and American Racism. DeWitt's transmittal document spoke of "Japanese" or "the Japanese" or "persons of Japanese ancestry" generally, and specifically to "American-born Japanese" but not to any such people as "Americans" or even "Japanese Americans" or "Japanese-Americans" (pages vii-x). Chief of Staff Marshall, in his brief transmittal note, spoke once of simply "persons of Japanese ancestry" (page iii). Secretary of War Simpson, in his Foreword, twice spoke of "persons of Japanese ancestry" then, at end, paraphrases DeWitt's "the Japanese" as "our Japanese population" -- apparently embracing "them" into "the Nation" whose safety he feels compelled to place above individual rights (page v, underscoring mine). 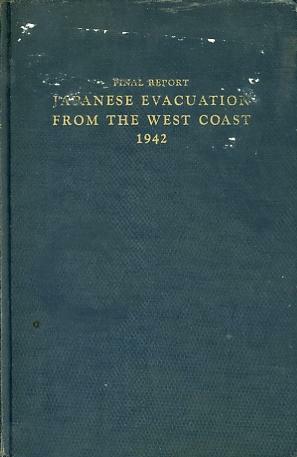 This volume constitutes a comprehensive report on the evacuation from West Coast areas of persons of Japanese ancestry carried out by the Army in the interests of military security during the spring of 1942. The considerations which led to the evacuation as well as the mechanics by which it was achieved, are set forth in detail. Great credit, in my opinion, is due General DeWitt and the Army for the humane yet efficient manner in which this difficult task was handled. It was unfortunate that the exigencies of the military situation were such as to require the same treatment for all persons of Japanese ancestry, regardless of their individual loyalty to the United States. But in emergencies, where the safety of the Nation is involved, consideration of the rights of individuals must be subordinated to the common security. As General DeWitt points out, great credit is due our Japanese population for the manner in which they responded to and complied with the orders of exclusion. The principal term used in DeWitt's report -- to describe the subjects of various "civilian exclusion orders" directed at Japanese nationals and Americans with one or more lineal ancestors who were or had been Japanese -- was "persons of Japanese ancestry". This is also the prevalent term in the report's Glossary, which tautologically defines "Japanese ancestry" -- i.e., without defining either either "Japanese" or "ancestry" (see excerpts from Glossary, below). It is clear in the final report, however, that "Japanese" is used to refer to a "race" of people, while "ancestry" is refers to lineal "blood" -- i.e., "racial" -- descent. "Japanese" is clearly defined earlier in the report, as in the Appendix to Chapter III, which reproduces DeWitt's own "Final Recommendation of the Commanding, Western Command and Fourth Army, Submitted to The Secretary of War" -- dated 14 February 1942. The recommendation also defines subcategories of "the Japanese" among what Stimson called "our Japanese population" (excepts from pages 34-36, underscoring and [bracketed comments] are mine). c. Disposition of the Japanese. (1) Washington. As the term is used herein, the word "Japanese" includes alien Japanese and American citizens of Japanese ancestry. In the State of Washington the Japanese population . . .
(2) Oregon. . . .
(3) California. . . .
d. Disposition of Other Subversive Persons. Disposed within the vital coastal strip already mentioned are large numbers of Italians and Germans, foreign and native born, among whom are many individuals who constitute an actual or potential menace to the safety of the nation. (c) Alien enemies other than Japanese nationals. (d) Any and all other persons who are suspected for any reason by the administering military authorities to be actual or potential saboteurs, espionage agents, fifth columnists, or subversive persons. (4) That the evacuation of classes (a), (b), and (c) from such military areas be initiated on a designated evacuation day and carried to completion as rapidly as possible. DeWitt's final recommendation was the basis for Executive Order No. 9066, dated 19 February 1942, which established military control of areas within the country from which persons could be excluded for reasons of security. Executive Order No. 9102, published on 18 March 1942, had established a War Relocation Authority in the Office for Emergency Management in the Executive Office of the President. These and other federal actions set in motion a chain of bureaucratic events that culminated in pamphlet and poster forms of the "Civilian Exclusion Order" and "Instructions to All Persons of Japanese Ancestry" which implemented their "relocation" outside designated Military Zones. In the Glossary, the term "national" is twice associated with "alien", and "national" is used a third time in reference to "Japanese". As seen in the first three -- (a), (b), and (c) -- of the four classes of persons to be excluded according to DeWitt's final recommendation (see above), the report attempts to make a clear distinction between "Japanese" as an alien who is a national of Japan on the one hand, and a "Japanese-American" as an American citizen of so-called "Japanese ancestry" on the other. This is an extremely important distinction from a legal viewpoint, which DeWitt and other framers of the evacuation scheme were careful to take into consideration, anticipating constitutional and other legal complications. However, the distinction comes secondary to primary definition of "Japanese" as including both "alien Japanese and American citizens of Japanese ancestry" -- i.e., "Japanese" and "the Japanese" are essentially understood to mean "persons of Japanese ancestry" meaning anyone with even one drop of putative "Japanese blood" -- regardless of their nationality. The reluctance at the end of the day to apply to "Italians and Germans, foreign and native born" the same relocation criteria imposed on "alien Japanese and American citizens of Japanese ancestry" was, of course, an inverse measure of the depth of white racism on the part of DeWitt and others who engineered relocation policy -- who did not, as a matter of record, attempt to hide their feelings toward "Orientals"generally and "Japanese" in particular. The following terms are cited from many more in the Glossary of DeWitt's report (pages 513-515, bold emphasis and (parenthetic comments) in original, underscoring and [bracketed comments] mine). Assembly Center -- A temporary enclosed area maintained by Army where persons of Japanese ancestry were housed and fed during primary stages of evacuation prior to transfer to War Relocation Projects. Blocked Account -- Any property or interest therein of a Japanese national which the Alien Property Custodian has declared to be vested in him under authority of Executive Order No. 9095. Evacuee -- A person of Japanese ancestry excluded from Military Area No. 1 and the California portion of Military Area No. 2, by proclamation of the Commanding General Western Defense Command. Evacuee National -- Includes all persons of Japanese ancestry subject to exclusion. Exemption from Evacuation -- Temporary privilege of remaining in Military Area No. 1 or California portion of Military Area No. 2 granted on authority of Paragraphs (e) and (f) Public Proclamation No. 5, and also under Mixed-Blood and Mixed-Marriage policies. Freezing Power -- Power of Alien Property Custodian under Executive Order No. 9095 to block property of Japanese nationals and to allow trading therein only on license. Internee -- An alien enemy interned by order of the Attorney General. (NOT to be confused with evacuee. Issei -- Any person of Japanese ancestry born in Japan. Sometimes called First Generation Japanese. Japanese Ancestry -- Any person who has a Japanese ancestor regardless of degree, is considered a person of Japanese ancestry. Kibei -- Any person of Japanese ancestry born outside Japan who has been to and returned from Japan. Particularly, American-born Japanese who have received some of their education in Japan. Mixed-Marriage -- Any marriage between a person of Japanese ancestry and a person not of Japanese ancestry. Nisei -- Any person of Japanese ancestry not born in Japan. Sometimes called Second Generation Japanese. Parolee -- An alien enemy once interned by order of the Attorney General but paroled from internment at the direction of the Attorney General. Relocation Center -- (War Relocation Center). The population section of a War Relocation Project Area. Relocation Project -- (War Relocation Project). Temporary community established and conducted by War Relocation Authority where evacuees under jurisdiction of War Relocation Authority are and fed. It has boundaries established by the Commanding General. Repatriate -- A person of Japanese ancestry who is returned at his request to Japan. Repatriation -- The process of returning persons of Japanese ancestry to Japan at their request. Sansei -- Children of Nisei. Sometimes called Third General Japanese. Segregation -- The process of separating persons of Japanese ancestry who are actively discordant and openly pro-axis from the remainder. Special Blocked Property -- Property in which an evacuee national has an interest, and which has been designated as special blocked property. Voluntary Migration -- Voluntary movement of persons of Japanese ancestry from Military Area No. 1 and California portion of Military Area No. 2, to points further inland, prior to evacuation under complete Army supervision as reflected by Public Proclamation No. 4, dated March 27, 1942. Deferments and exemptions for persons of "mixed-blood"
The Public Proclamations and Restrictive Orders provided for the immediate evacuation of all persons of Japanese ancestry. However, certain exceptions were made in the interest of justice. There were Japanese children in orphanages, for whom proper facilities were not available in the Assembly Centers. There were Japanese in institutions who required special attention, which the Assembly Centers were not equipped to provide, and those who were imprisoned. Deferment from evacuation was granted these persons until their physical condition permitted movement or until they were released. Early in the evacuation program another problem requiring special consideration was presented. Included among the evacuees were persons who were only part Japanese, some with as little as one-sixteen Japanese blood; others who, prior to evacuation, were unaware of their Japanese ancestry; and many who had married Caucasians, Chinese, Filipinos, Negroes, Hawaiians, or Eskimos. Most of these people were American-born, and had been through American schools, had not developed Oriental thought patterns or been subjected to so-called Japanese culture. Because of their Americanization and their awkward social position, life in the Japanese Centers proved a trying and often humiliating experience. The adults were ostracized and the half-caste children ridiculed. Their presence in the Assembly Centers was the source of constant irritation to the Japanese, provoked bad feelings and added to the difficulties of administration. Although non-Japanese spouses were eligible to reside in the Centers, many of them found life in a totally Japanese community unbearable, and left, thus breaking up the family group. Families consisting of a Japanese wife, a non-Japanese husband, citizen of the United States or of a friendly nation, and their mixed-blood unemancipated children. Families consisting of a Caucasian mother, citizen of the United States or of a friendly nation, and her mixed-blood children by a Japanese father (either dead or separated from the family). Mixed-blood (one-half Japanese or less) individuals, citizens of the United States or of friendly nations, whose backgrounds have been Caucasian. Japanese unemancipated children who are being reared by Caucasian foster-parents. [Note 1] Other mixed-marriage families and mixed-blood individuals were made eligible for release from the Assembly Centers upon the condition that they leave the Western Defense Command area. This feature of the program was incidental since persons eligible were transferred to War Relocation Centers and out of the jurisdiction of the Army before many relocations could be arranged. Many of these were released by War Relocation Authority with Army consent to take up residence within the Western Defense Command area but outside the evacuated zone. Only ten families left the Assembly Centers for residence outside the Western Defense Command area. As a condition to release, each applicant's name was submitted to the several intelligence services, including the Federal Bureau of Investigation, Office of Naval Intelligence, and the office of the Assistant Chief of Staff, G-2 and to the police chief of the local community where the applicant intended to establish residence. If the applicant had a clean record and his residence in the community was not objected to by the local authorities on the ground that it would provoke incidents, exemption from evacuation was authorized. Persons who for one reason or another had not been evacuated and were still resident in the evacuated areas. Persons in War Relocation Authority Centers. Persons who had voluntarily left their families in the evacuated areas, and had established residence elsewhere. The applications of such individuals for permission to reside in the evacuated area were considered, and where it was deemed necessary, the applicant's background was investigated through the Public Assistance Division of the Federal Social Security Board. If the applicants were found to be eligible under the mixed-marriage policy, permits were issued after the necessary intelligence and police clearances had been secured. To keep informed of the whereabouts of persons of Japanese ancestry in the event future developments require a different solution of the mixed-marriage problem or require the apprehension of an individual. To keep advised of the community attitude with respect to the residence of Japanese in the evacuated area, since community attitude is a factor bearing on the ultimate success or failure of the mixed-marriage program. Mixed-blood children are being reared in an American environment. Mixed-blood adults predominately American in appearance and thought have been restored to their families, to their communities, and to their jobs. DeWitt's 1943 report the "Japanese" evacuation from the West Coast in 1942, makes the following observation in Chapter XVII, "Education, Recreation, Religion and Assembly Center Newspapers" (page 208, underscoring mine). Specialists in the arts and crafts were many among the Japanese and their classes were well attended. Isamu Noguchi, internationally known sculptor, was a resident of Santa Anita; Professor Chiura Obata, whose paintings were exhibited at Mills College, lived and taught at Tanforan. Many excellent musicians contributed their talents to the class-room. From these classes there emerged orchestras of symphonic size for rendition of the classics and ensembles to delight with dance and informal musical programs. Chiura Obata (小圃千浦 Obata Chiura, 1885-1975) was a faculty member at the University of California at Berkeley, and he and his wife were running an art supply shop on Telegraph Avenue, at the time Pearl Harbor was attacked. They and their children spent a few months at Tanforan Assembly Center, just south of San Francisco, before going on to the Topaz War Relocation Center in Utah. Obata and his family had been released, to resettle in St. Louis, Missouri, by the time DeWitt submitted his report. Both Obata and his wife, Haruko Kohashi (1892-1989), had come to the United States from Japan when in their late teens and were Japanese nationals at the time they were evacuated. After the war he returned to his post at Berkeley, but he and Haruko had been forced to close and sell their shop before reporting to Tanforan, after someone fired a gun at it. Isamu Nobuchi (1904-1988), though he a spent quite a bit of time in Japan and had a Japanese name (野口勇 Noguchi Isamu), was born in Los Angeles, and was never one day in his life a Japanese national, having never been recognized by his father, Yone Noguchi (野口米次郎 Noguchi Yonejirō, 1875-1947). DeWitt places Noguchi at Santa Anita Assembly Center, in Los Angeles County, but other accounts say he voluntarily became an internee at Poston War Relocation Center in Arizona in May 1942. By June, though, he appears to have become disenchanted with the conditions at Poston, with no hope of implementing some of his plans for the camp, and applied for permission to leave, but not until November was he permitted to visit New York, his legal residence. He never returned to Poston, though, and at one time the FBI tried to deport him. The Index of DeWitt's report, which has very few mechanical errors, lists Noguchi as "Noguchi, Isami" (page 613). For more about Noguchi, see Prominent people of mixture: 1850s to 1940s. Isamu Noguchi is the most famous of the putatively "mixed-blood" internees. Not all were released under the exemption policy described in DeWitt's report. As far as camp experiences go, Isamu Noguchi had a very different experience -- and relatively easy time -- compared to, say, Henry Mittwer, who became involved in camp politics, ended up in a camp for internees considered disloyal to the United States, and also lost his US citizenship. Mittwer was unable to restore his US citizenship, through court litigation, until until 1951. By 1961 he had returned to Japan, where he became a disciple at a Buddhist temple and later a priest. For more about Mittwer, see Prominent people of mixture: 1850s to 1940s.